T3 Energy Services, a unit of Robbins & Myers Inc., has been safely providing well control performance services that have set the standard in the oil and gas industry for value, quality, and overall customer satisfaction for over 30 years. T3 Energy Services designs, manufactures, repairs, and services high- and low-pressure wellhead products, blowout preventers (BOPs), production manifolds, engineered gate valves, rig floor control systems, and test units. These products are used to drill and complete new oil and gas wells, refurbish existing wells, and produce and transport oil and gas. The company’s high-quality products and services exceed industry standards. They are used in both onshore and offshore applications for clients operating in active oil and gas basins throughout the world. T3 Energy Services offers customers timely, cost-effective products and services that enhance performance while driving down operating costs. T3 Energy Services began using SOLIDWORKS® software in India in 2009 and in Houston, Texas in 2004. Their design process involves sketching out ideas (referenced to standards), preliminary modeling, checking part operation, and motion simulation for assemblies and sub-assemblies. It also includes a structural integrity check of the assembly, and confirms this with mathematical calculations to avoid unnecessary prototype building. Various teams are involved in product development at different stages. Each group contains seven to eight engineers and there are five groups in Design and Engineering. They don’t subcontract the work because they have full in-house engineering and manufacturing capabilities across the globe. 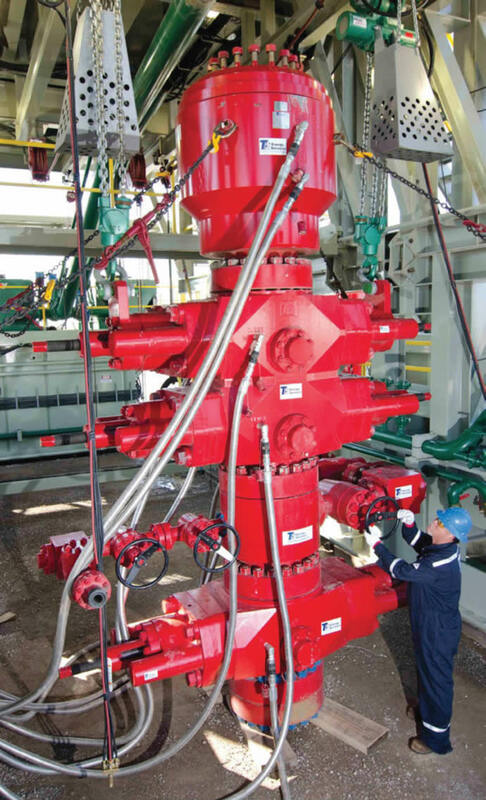 Onshore and offshore equipment safety is of prime importance for the oil division, so high-strength structural integrity must be guaranteed for each individual part and assembly before it is placed in service. Another important goal was to have tight integration of SOLIDWORKS with ENOVIA® (PLM), another Dassault Systèmes product used for the engineering database. SOLIDWORKS has made T3 Energy Services more productive by enhancing the delivery of FEA reports, reducing FEA modeling time, and simplifying access to the database via SOLIDWORKS to PLM. Currently T3 Energy Services is using SOLIDWORKS Premium and SOLIDWORKS Simulation Premium. They chose SOLIDWORKS because it has a more user-friendly operating interface than any other commercial finite element analysis (FEA) software and is cost-effective. SOLIDWORKS integrates seamlessly with CAD, Simulation, and Flow Simulation. The company also receives excellent technical support from the Value-Added Reseller. One of the key reasons T3 Energy Services short-listed SOLIDWORKS was the integration of CAD and FEA, which has saved time that used to be spent on creating multiple models. Their other goals were to improve communication, encourage design reuse/standardization, accelerate time-to-market, and reduce product development costs. SolidWorks helps them to render variations on old designs very efficiently, and sharing the same work methods makes design team cooperation easier. T3 Energy Services has designed ram blowout preventers, BOP stacks, wellhead products, and flow control products using SOLIDWORKS software. They value the SOLIDWORKS Simulation feature that includes various analytical methods all under one tab, integrated with CAD, to reduce overall rework time and speed up delivery. No other design software they’ve seen offers this basic feature. Impart high structural integrity to each individual part and assembly. Employ SOLIDWORKS solutions to integrate CAD and FEA, eliminating the excess time spent on creating multiple models.